The Institute of Buddhist Dialectics was founded in 1973 on the 37th birthday of His Holiness the 14th Dalai Lama under the directorship of Geshe Lobsang Gyatso. Initially it hosted a humble 27 students with very few international students. This course afforded monks and lay students a recognized Bachelor of Arts (BA) degree so that they may be qualified to study further or even introduce themselves into the job market. The programme integrated the continuation of an important tradition into a pragmatic and systematic academic opportunity. At that time the only course of study offered was a seven- year programme on the Prajna Paramita. The exemplary results and enthusiasm of students was extremely commendable and His Holiness suggested that the students who did well would benefit from continuing to study Madhyamika and Pramana from the major Buddhist study program. Since then the programme has drawn more and more students from monastic, lay and international backgrounds. Currently there are 120 students, of which 20 are foreign students. The courses offered at IBD in chronological order are as follows- 1. A seven-year course in Prajna Paramita; 2. A three-year course in Madhyamika Buddhist Philosophy; 3. A four year course called Rime Lopon – which is an Acharya programme and includes Vinaya, Abhidharma and important core texts of three lineages: Sakya Nyima, Kagyu; A two-year course on Tantric studies and practices: Lama Tsongkhapa’s ‘Stages of the path’ and Guhyasamaja Tantra. If followed to its completion, the programme provides a comprehensive and extensive understanding of the Sutras and of Tantra. 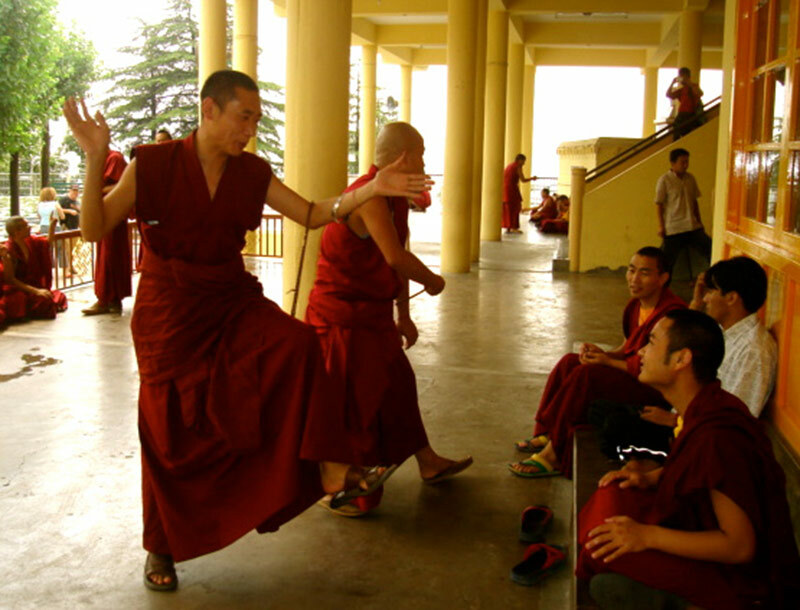 The students also study English, advanced Tibetan language, history and literature. Scholars are invited from time to time to give talks on modern subjects like science to offer a holistic approach in understanding phenomena and philosophy. The program awards Bachelors degrees, Masters Degrees, Masters of Philosophy (M.Phil) and finally on completion of all 16 years of study, students are awarded a Geshe degree, which can be likened to a PhD degree. The institute is proud to have produced expert scholars, researchers, administrators, and teachers. A great majority of His Holiness’ translators are alumni of IBD. The English, Chinese, Vietnamese, Korean and Spanish translators are all products of the Institute of Buddhist Dialectics. Geshe Lhakdor, director of Tibetan National Library, Geshe Dorje Damdrul, director of Tibet House, New Delhi and Cabinet Secretary of Central Tibetan Administration, Ven Karma Gelek are all ex-students as well. 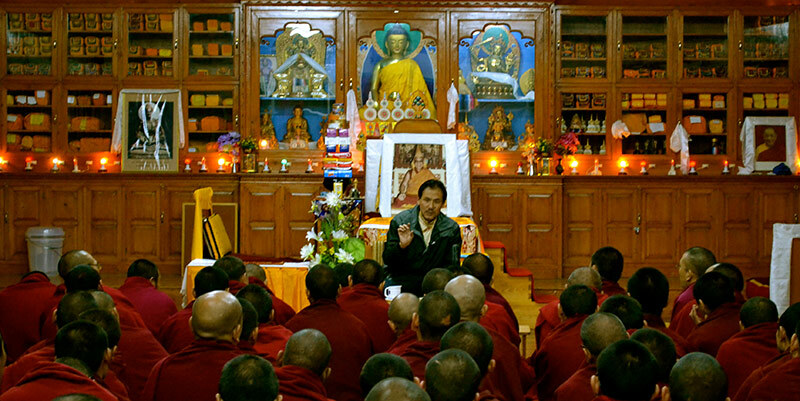 The institute has made very significant contributions in Tibetan education and administration. Likewise, several international alumni are now authors, teachers and expert scholars in the west like George Dreyfus, Allen Wallace, Garrett Spartham and Geoffrey Hopkins. Upon the suggestion of His Holiness the Dalai Lama, IBD has made it a decisive priority to give women the same opportunities in pursuing philosophy as is given to men. Geshe Kelsang Wangmo is the first woman ever to receive the Geshe degree, which was awarded to her by IBD. Currently she teaches at the dialectic school and also teaches students of Emory University. She did not speak a word of Tibetan when she arrived and IBD and after spending 17 years studying and receiving a prestigious title, she serves as a beacon of encouragement to the sisterhood of female aspirants. This marks a great achievement and helps inspire women in their studies as the Tibetan society was not able to provide the same opportunities for women in the past. Under His Holiness’ advice, the institute agrees that the study of Buddhism should not be confined to monks and nuns, to which end there is a weekend programme for roughly 200-300 lay people. The study of logic and philosophy also should be shared and learned by the general public starting from budding students in school. Therefore IBD sends some of its most learned members to the Tibetan Children’s Village school every year in an effort to inculcate a sense of ethics and curiosity about philosophy from an early age. The Emory-IBD affiliation began in 2001 and gave the institute international recognition. A semester long five-month exchange is held every year. Students are first sent to the Saraha Campus (a sister school closely affiliated with IBD), and are then brought up to the McLeod Ganj campus. 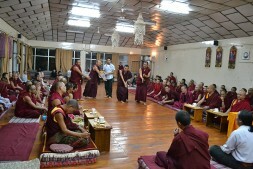 The students stay with Tibetan families making for a great experience by immersing them completely in Tibetan culture. 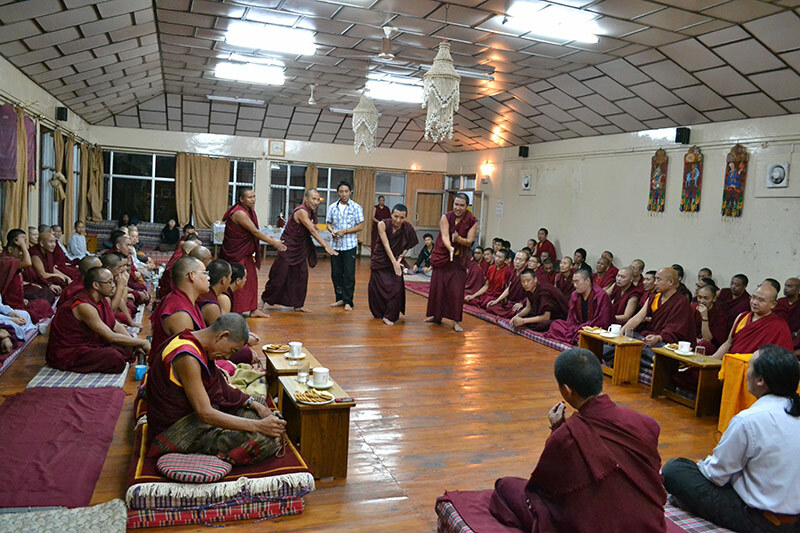 The students are given a broader window outside of academics through this unique accommodation, by learning how Tibetanscook, pray, interact with their families, allowing them to observe Tibetan children and senior citizens alike and participating in the chores and festivals. This experience gives the students rare insight into Tibetan culture. At IBD they study language, culture and history. In addition to this exchange, another programme was started five years ago, which is a summer programme for Emory students. Students get to interact with monks and nuns who are studying science in the Saraha campus. Geshe Lobsang Tenzin Negi who is an alumni of IBD is now a senior lecturer at Emory University and the director of this programme. Another important part of this programme takes its form in debate in the Buddhist study tradition. The practice of debate is guided by the study of logic which is called ‘Riglam’ in Tibetan. Rig means reasoning and lam means path, together meaning the path of reasoning. The Buddha said we should not be satisfied with just his teachings but should venture to investigate them, “like a goldsmith investigating the fineness of his substance by cutting, melting and analyzing the gold” explains Venerable Geshe Damdul, director of IBD. Through investigation we can begin to understand the reality of life, phenomena, environment, samsara and nirvana. Debating or the use of logic, which is an important part of the curriculum, plays a very crucial role in deepening the understanding of whatever is taught in class. Wisdom arising from listening is not acquired from merely hearing. First we must hear, then study, investigate, reflect and analyze. Logic is important to sharpen wisdom at the intellectual level. Initially students learn to differentiate basic concepts like colour and shape. Slowly this skill is honed to delve into deeper levels of study based on texts, like the understanding of impermanence and the cultivation of mind of the Bodhisattva.